In today’s blog post, All West Surface Prep would like to share with you some ideas and tips for improving the interior of your workspace. Contact us today for concrete resurfacing, grinding, polishing, leveling, and more! It is estimated that around 90 percent of shoppers turn right when they enter a store. For whatever reason, this just seems more natural. Take advantage of this unconscious habit and position your best-sellers on the right side of your store. You can organize the rest of your store, using the right side as your starting point. In retail spaces, it is important to create a threshold area, also sometimes called a decompression zone. This space is the area where customers first enter your store. As a rule of thumb, interior designers recommend leaving the first 5 to 15 feet open. The general idea behind this thinking is that it gives customers an opportunity to transition between the outside and your store. Not only does creating this threshold allow customers to appreciate all of your interior design elements — lighting, displays, colors, etc. — but letting them transition also gives you a better chance of selling products. As many studies, including this one by the University of Texas, have concluded, the colors of an environment can have a measurable impact on the mood and behavior of those in the room. This is something that should be kept in mind when designing or renovating a commercial space. Taking advantage of the colors of both your walls and floors can not only impact customers, but it can also affect your employees. Utilize color theory to control the comfort, productivity, and habits of your guests. 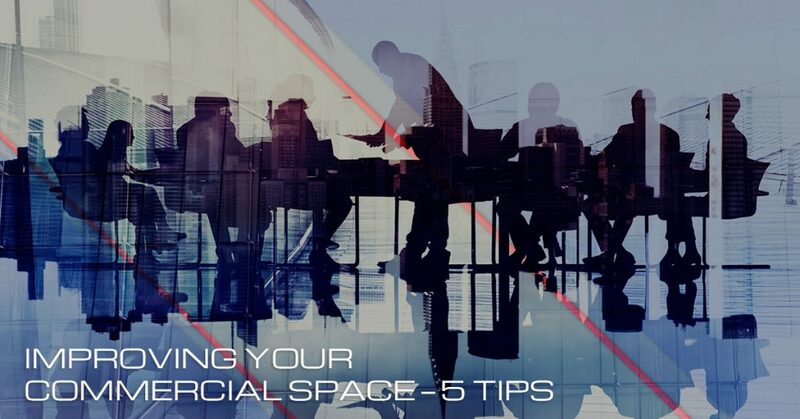 The floors of your commercial space matters. And while there a lot of updates that can instantly improve and change your commercial space, new flooring is perhaps the most powerful. Although commercial flooring typically doesn’t come to the forefront of your mind, it certainly impacts first impressions. If you have old and ugly concrete floors, have you considered concrete resurfacing? If you’re thinking that this isn’t feasible or that your old floors are beyond repair, you may be surprised. For example, if you work with expert concrete resurfacing contractors, like All West Surface Prep, we can turn your old floors into a new, durable, and shiny work of art. Check out this blog on concrete resurfacing to learn more about the process, your options, and how it can impact your commercial space. If you are in the Denver area and are looking to update the concrete floors in your commercial space, contact us today for more information and your free estimate. We have resurfaced concrete floors for local facilities, schools, retail stores, restaurants, and various other commercial spaces.